I have just downloaded some videos through torrents mostly that come through as HD x264 mkv, HD AVI, TS, FLV, etc files. Looks great on a computer but when I send them to my Nokia N8, it popup an error that Hp1080p/1080i do not play in my Nokia N8 and it is not allow to transfer these HD1080p/1080i clips . I searched on google to find the answers about that but it doesn't appear. Who can explain to me? And show me any ways to tackle it? Obviously, Nokia N8 don’t play HD 1080p/1080i videos, even the HD MKV, AVI, FLV, TS are not the suitable format for Nokia N8. So if you get an Nokia N8, and wanna play HD 1080p, HD 1080i movies, you need downsize and convert HD MKV, AVI, FLV, TS, M2TS, MTS, etc to 720p H.264 MP4 for Nokia N8. Aunsoft Nokia N8 HD Video Converter is designed to give you more choice to enjoy kinds of movies. It supports to convert and downsize HD 1080p/1080i videos to HD 720p MP4 for Nokia N8, including but not limited to 1080P or 1080i HD MKV, MTS, M2TS, EVO, HD AVI, HD MPG, TS, etc. Have a look at the steps below to convert/compress 1080p/1080i videos like HD MKV/MTS/M2TS/EVO/AVI to Nokia N8, and output movies up to HD 720p resolution. Step 1. 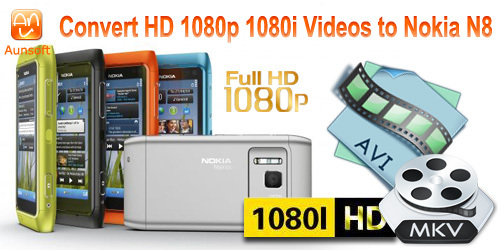 Load HD 1080p, HD 1080i videos to Aunsoft Nokia N8 HD Video Converter. Run Aunsoft Video Converter as the perfect HD Video Clips to Nokia N8 Converter, and click the "Add" button to load HD videos in formats like MKV, MTS, M2TS, EVO, HD AVI, MPG, TS,. Step 2. Choose 720P HD MP4 format for Nokia N8. Click the "Format" option and choose iPhone 4 > iPhone 4 HD 720p MP4 Video (*.mp4) as output format for Nokia N8. This 720P MP4 can perfectly play on Nokia N8. Step 3. Convert HD 1080p/1080i videos to 720p MP4 for Nokia N8. Click the convert button under the preview window, and the conversion from HD MKV/M2TS/EVO/AVI to Nokia N8 720p MP4 starts immediately. After conversion, just transfer your converted HD 720P MP4 to Nokia N8 for enjoyment.